Minimum quantity for "Sony VPL-HW45ES and Majestic HD Screen package" is 1. NOTE: THIS PACKAGE NOW COMES WITH THE 45ES MODEL. INCREDIBLE INTRO PRICING @ $4999 FOR A 45ES, 100 INCH EVO4K Majestic Screen and Premium Peerless Geared Mount! 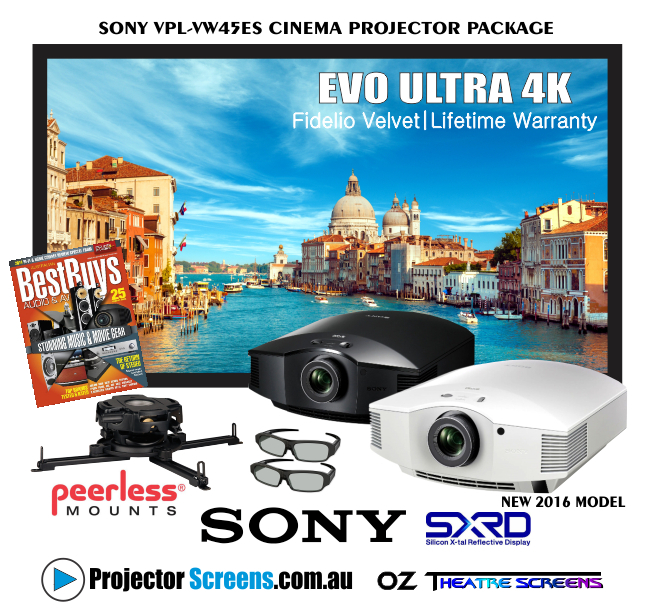 Sony's all new VPL-HW45ES cinema quality projector and Majestic Screen package. This package includes the all new 2016 model from Sony, the VPL-HW45ES Projector with 2 bonus Sony 3D glasses, flagship Majestic Screen with Evo Ultra4K material and the top of the line Peerless universal geared projector mount. Projector available in black or white! Use checkboxes to upgrade screen size. Package is based on 100 inch Majestic screen. Custom sizes available up to 150 inches in Evo4K vinyl. Need help with projector placement, screen sizing and seating positions? CALL US 07 556 1960 or 0402 424 177 and talk direct with the screen designer and manufacturer.